RESTON, Va. & SACRAMENTO, Calif.–(BUSINESS WIRE)–Avizia, powering system-wide telehealth, has announced its partnership with VeeMed, a leading provider of physician services for telehealth. The partnership aligns Avizia’s system-wide telehealth platform with VeeMed’s provider services for high-acuity use cases including neurology, behavioral health and intensive care—offering healthcare organizations flexible options to staff and power high-quality, comprehensive virtual care programs. Through its collaboration with VeeMed, Avizia is able to offer healthcare organizations the full suite of telehealth tools and resources they need to conduct secure, seamless remote virtual consultations for high-acuity specialties. The combined Avizia/VeeMed solution will boost healthcare organizations’ existing programs. In the case of telestroke, for example, Avizia’s telehealth technology equips VeeMed neurologists with enhanced far-end camera control, PACS image access and the care coordination and collaboration features they need to efficiently and effectively assess and treat stroke patients when time is of the essence. “A great physician network is strengthened by the technology that powers a health system’s telehealth program,” says Jim Roxburgh, cofounder and COO at VeeMed and former director of the Dignity Health Telemedicine Network. Interest in telehealth among healthcare providers is at an all-time high, according to Avizia’s 2017 Closing the Telehealth Gap report. Organizations that use telehealth are largely interested in leveraging the technology to expand access/reach (70 percent) and improve patient outcomes (55 percent). They are especially excited about telehealth’s potential to strengthen their stroke/neurology (72 percent); behavioral health (41 percent); and intensive care (20 percent) programs. Avizia enables more than 40 unique telemedicine use cases and is the leader in system-wide telehealth. Avizia’s platform can scale from a single program administered by a small healthcare organization to a powerful system-wide virtual care delivery initiative. Avizia’s platform is interoperable with any EHR, allowing for a seamless telehealth experience across all devices and form factors. 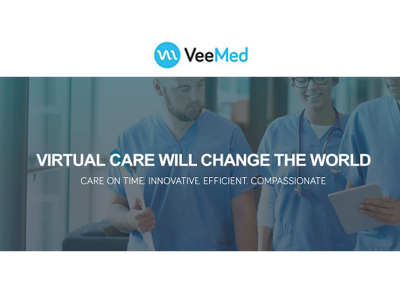 VeeMed is a global telemedicine company focused on virtual clinical patient healthcare services and advanced telemedicine technology in chronic care, nephrology, pulmonary medicine, neurology and mental healthcare. Visit www.veemed.com.